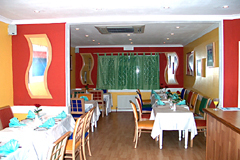 We, at the Chipstead Tandoori, take great pleasure in giving our customers an atmosphere of friendliness and sincerity in which they can enjoy the genuine aromatic dishes. Good quality ingredients are used with great care and experience with some interesting and original touches. Some of our most popular dishes are Tandoori Lamb Chops, Lamb Xacutti and Manchurian Chicken. Our sweets include home-made ice cream, orange and lemon sorbets. Open Tue-Thur & Sun 12-2.30pm and 6-11pm, Fri-Sat 12-2.30pm and 6-11.30pm. Closed Monday. All major credit cards accepted. We specialise in Balti and Tandoori dishes. We are renowned for our high standards of food and service and we proudly claim we have the best chef around - come and judge for yourself.